Solar home designs that include passive solar heating (and cooling) are taking advantage of the most natural way to make use of renewable energy. When I began studying passive solar designs, I was amazed at how much renewable energy was available by merely orienting a structure so that the sun's energy can be optimized. There are three methods used in passive solar home designs - direct gain, indirect gain, and isolated gain. 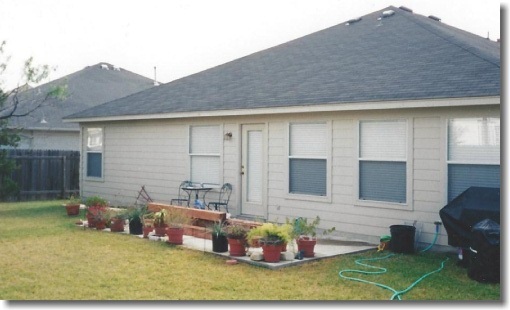 Adding a patio cover to your home is an easy way to take advantage of the direct gain method of solar home design. 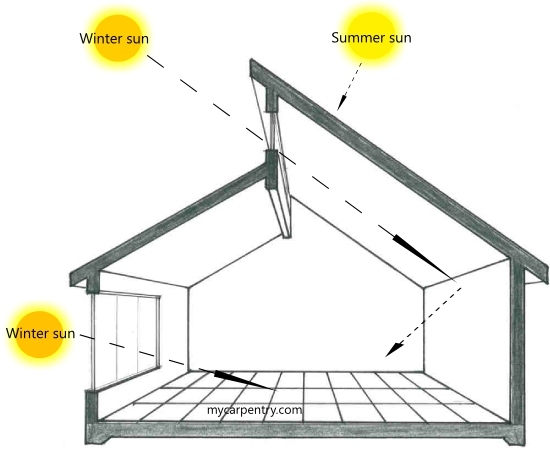 The direct-gain system is the most common type of passive solar design. The idea of the direct gain system is to design and position a house to make use of the heating capabilities of the sun. Design your house so that in the winter, the sun shines through windows onto an internal brick wall or a large area of concrete or tile floor. These high thermal mass materials absorb heat during the day and slowly release heat during the night to help keep the house warm. 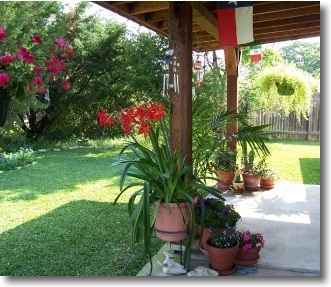 Since I live in central Texas, my focus was primarily on how to keep my house as cool as possible in the summer. If your home is already built, there are several things that you can do to optimize your house for passive solar efficiency. After time, you have probably already figured out that certain rooms in your house are warmer in the summer than others. At the same time, you have probably noticed rooms that are cooler in the winter. The first year I lived in my house, I noticed that on summer afternoons, the sun shined directly on the back north-west side. The air conditioner would run for extended periods of time to maintain a comfortable temperature. Outside the back door, there was a 10' x 10' concrete patio slab that was not usable during the afternoon. As the day progressed, the sun would become so intense that you could not sit on the patio. I decided that a patio cover would be a great addition to my house and would provide a cooler outdoor living space on those hot summer afternoons. I extended the size of my 10' x 10' patio so that it had a finished size of 10' x 20'. I built my patio cover so that it had sufficient overhang on both sides and the front to provide complete shade on the concrete patio floor in the middle of the afternoon. I built my patio cover using western red cedar. This material is beautiful and great to work with. I used 6x6s for the posts, 4x6s for the beam, and 2x4s for the rafters. For the roofing, I used fiberglass shingles that matched the roof of my house. When using this type of roofing, you have to make sure that you design enough pitch on your roof to comply with the shingle's minimum pitch requirements. Your own home design will dictate your patio cover shape and style, so I won't go into the details of how I built mine, but if you would like some information please use my contact us page. As a side benefit to having a great new outdoor room to spend time, the patio cover also shaded that back side of my house and made the inside of my house noticeably cooler. 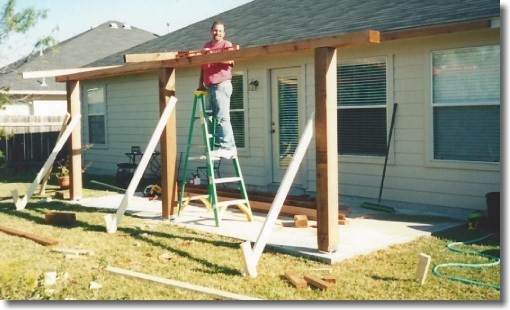 It has been 11 years since I have built my patio cover and I am certain that, in much less time than that, my lowered electricity bills paid for all of the materials that I used to build it. 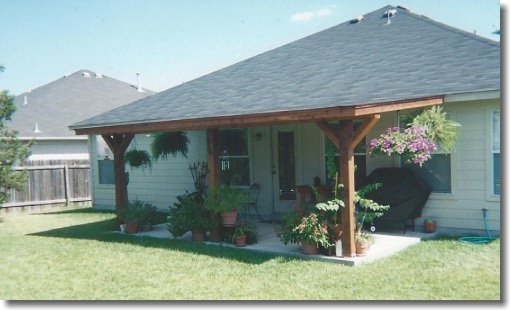 A patio cover is a great example for the direct gain type of solar home design for an existing home. If you haven't yet built your home, or if you are planning to build a small cabin on your lake property (as I might do someday). It is worth taking a look at the indirect gain and isolated gain designs too. An indirect gain system uses a high thermal mass wall made of concrete, brick or stone, that is located between a glazing system (or series of windows) and living area. Sun shines through the glazing onto the wall, usually painted black to maximize heat absorption, and can continue to provide heat after the sun has set. This design can be used with a direct gain system so that it takes over providing heat when the direct gain system is no longer available. The isolated gain solar home design is somewhat more involved. It involves a sun room space located on the south side of the house where the sun shines predominately in the winter months. The sun shines on a thick wall that is painted black so that it absorbs the most heat. Vents located between the sun space and living space allow the flow of warm air between spaces. At night the vents can be closed so that the warm air can be contained in the living space.